The incredible true story of one man’s escape from Nazis in Norway. I remember reading We Die Alone in 1970 and I could never forget it. Then when we went to Norway to do a docudrama, people told us again and again that certain parts were pure fiction. Since I was a Norwegian that was not good enough; I had to find the truth. I sincerely believe we did,” writes author Astrid Karlsen Scott. 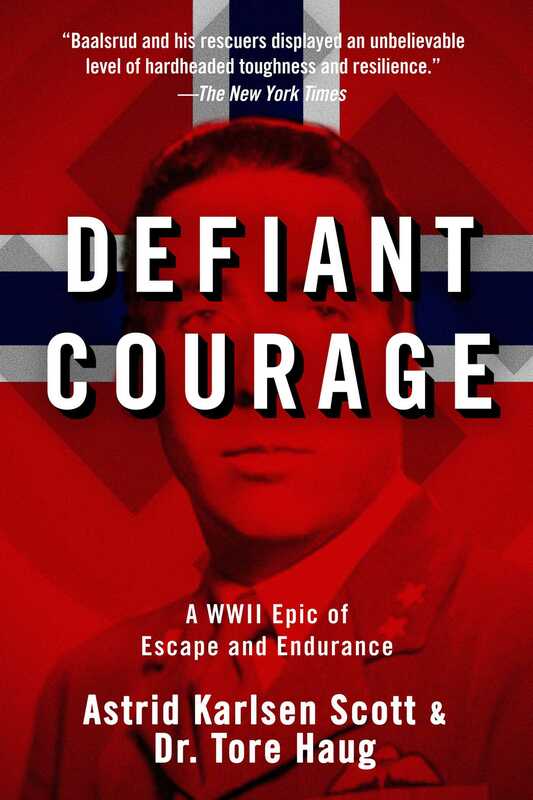 Defiant Courage is the true story of what Jan Baalsrud endured as he tried to escape from the Gestapo in Norway’s Troms District. In late March 1943, in the midst of WWII, four Norwegian saboteurs arrived in northern Norway on a fishing cutter and set anchor in Toftefjord to establish a base for their operations. However, they were betrayed, and a German boat attacked the cutter, creating a battlefield and spiraling Jan Baalsrud into the adventure of his life. The only survivor, a wounded Baalsrud begins a perilous journey to freedom, swimming icy fjords, climbing snow-covered peaks, enduring snowstorms, and getting caught in a monstrous avalanche. More than sixty people of the Troms District risk their lives to help Baalsrud, suffering from snow blindness and frostbite, to freedom. Meticulously researched for more than five years, Karlsen Scott and Haug bring forth the truth behind this captivating, edge-of-your-seat, real-life survival story. Astrid Karlsen Scott first became acquainted with Jan Baalsrud’s story in 1970. In 1997, she began serious investigation of the details of the story. Scott has returned to Norway eight times in a period of three years in her efforts to find the truth. She met Dr. Tore Haug in 1997; they decided to combine their work and made many joint and separate trips to the Troms District to research this book. To gain a complete understanding of this magnificent drama, the coauthors explored the sites where the events took place, hiking up mountains and examining landmarks. Scott and Dr. Haug also met and interviewed all the survivors who helped Jan or who were indirectly involved and had knowledge of his story. Astrid, a native of Norway, is internationally known for her books on Norwegian culture. Her award-winning video, Christmas in Norway, has been shown on television in the United States and in Europe. She is also president of Nordic Adventure, a company dedicated to the promotion of Norwegian culture. She and her husband, Melvin McCabe Scott, Jr., live in Olympia, Washington. They have three children and thirteen grandchildren.